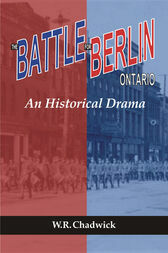 In August 1914, Berlin, Ontario, settled largely by people of German origin, was a thriving, peaceful city. By the spring of 1915 it was a city torn apart by the tensions of war. By September 1916, Berlin had become Kitchener. It began with the need to raise a battalion of 1,100 men to support the British war effort. Meeting with resistance from a peace-loving community and spurred on by the jingoistic nationalism that demanded troops to fight the hated “Hun,” frustrated soldiers began assaulting citizens in the streets and, on one infamous occasion, a Lutheran clergyman in his parsonage. Out of this turmoil arose a movement to rid the city of its German name, and this campaign, together with the recruiting efforts, made 1916 the most turbulent year in Kitchener’s history. This is the story of the men and women involved in these battles, the soldiers, the civic officials, the business leaders, and the innocent bystanders, and how they behaved in the face of conditions they had never before experienced. "It is a very good read. Particularly notable is his fine sense of detail, from which many a historian could learn a lesson or two.... Chadwick's book (like the play) is intended primarily for a popular audience. Both works deserve a substantial audience, and not just from Kitchener, for what they suffer in historical objectivity is largely offset by their detailed and highly entertaining presentation."